The world of technology, digital marketing and social media is having a significant impact on how we behave socially, act as consumers and how we do business. If you're reading this, chances are you're either a marketing professional or a business owner who understands the importance of internet marketing today. You 'get it' that traditional marketing methods are becoming both ineffective and expensive, and you know that if you neglect to market your business online, you'll be missing out on the powerful results that an effective internet marketing strategy can bring about! If we build a website, visitors will come. That's the plan! However, if you really want to attract visitors (and potential customers) to your business's website, you need to do more than simply build it: you need to optimize it. Search engine optimization, or SEO, is the key to getting your website discovered via search engines like Google, Bing, and Yahoo. The traditional approach to SEO involves two sets of tactics: on-page SEO and off-page SEO. While on-page and off-page SEO are helpful concepts, they are rooted in an approach that is going by the wayside. In the past, the goal of SEO was to impress (or trick) the search engines so that they'd give you higher rankings -- with the ultimate goal being to achieve the coveted #1 spot in the search results for one of your target keywords. Today, search engines are smarter. They can tell the difference between spammy websites that are designed to game the system, and legitimate websites that are providing, relevant high-quality content. Modern SEO is about optimizing for the searchers, not the search! Social media provides a platform for direct communication between your customers, prospects, and employees. What's more, it is a key driver of content distribution and brand visibility online. 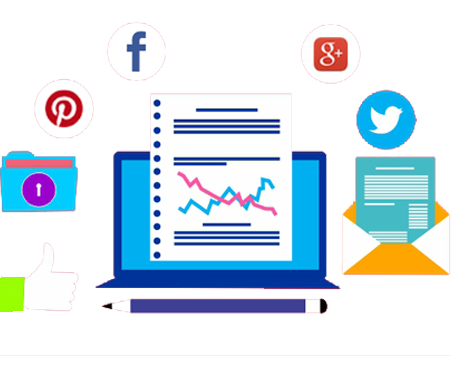 While there are a wide array of social networks that you can use to your advantage, we focus on the ones relevant to your industry, business, target audience and business goals!